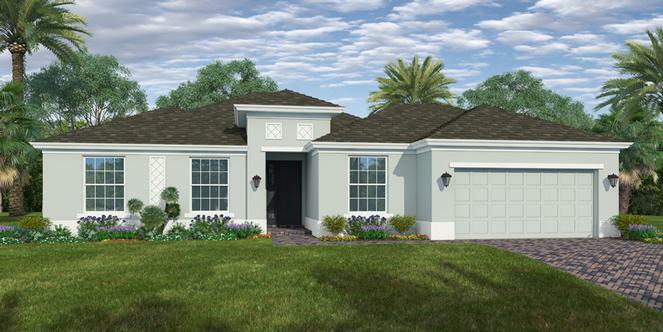 GHO Homes newest and very popular floor plan: Our Marlin 5 with a 2 bay car garage. IMPACT Windows throughout. 9'-12'8" ceiling heights with 8' DOORS. Tile in All Living Areas, Paver walkway, entry and covered rear patio. Private well with irrigation system and fully sodded yard (floratam). Gourmet Kitchen with a Double-Oven, 42’’ Cabinets. Full SS Kitchen appliance package. Granite tops and tub/shower tile throughout the baths. Front entry and covered Rear Patio with coordinating shingles. Nice 4' feet forward extension for the 2 bay garage!